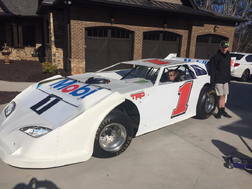 Late model stock racing cars for competing in dirt racing. Built with tub frame chassis and aluminum bodies, their engines are based on the big power plants from Ford, Chevy and MOPAR, either crate engines are specially designed engines. Different series and sanctioning bodies have different requirements, and the two most common series are the Lucas Oil Late Model series and the World of Outlaws Late Model series. 2016 Longhorn for sale come as a roller. has the best of the best on it.